The Government of India is committed to implement Goods and Services Tax (“GST’) in India from April 2017. It is believed that GST will be a game changer for the Indian economy. Not only it will lead to complete overhaul of indirect tax system, it will change the way a business works. Let’s understand what GST is all about. GST is a destination based tax on consumption of goods and services, which implies that the tax will accrue to the taxing authority which has jurisdiction over the place of consumption (termed as place of supply). It is proposed to be levied at all stages right from manufacture up to final consumption with seamless credit for taxes paid at previous stages. Alcohol for human consumption, Petroleum Products viz. petroleum crude, motor spirit (petrol), high speed diesel, natural gas and aviation turbine fuel & Electricity are kept outside the purview of GST. Article 246A of the Constitution empowers the Centre and the States to levy and collect the GST. Administration of GST will be the responsibility of the GST Council, which is the apex policy making body for GST. Members of GST Council comprise Central and State ministers in charge of the finance portfolio. The rate of GST is yet to be notified. Exports would be zero-rated, and imports would attract tax in the same manner as domestic goods and services. In addition to the IGST, in respect of supply of goods, an additional tax of up to 1% has been proposed to be levied by the Centre. Revenue from this tax is to be assigned to origin states. This tax is proposed to be levied for the first two years or a longer period, as recommended by the GST Council. Considering the Constitutional requirement of fiscal federalism, a dual GST will be implemented. 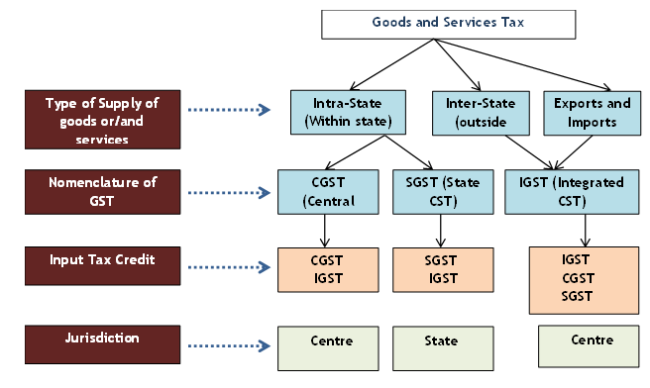 The GST to be levied by the Centre on intra-State supply of goods and / or services would be called the Central GST (CGST) and that to be levied by the States would be called the State GST (SGST). Similarly Integrated GST (IGST) will be levied and administered by Centre on every inter-state supply of goods and services. Rate of CGST is 10% and that of SGST is 10%. The dealer would charge CGST of Rs. 10 and SGST of Rs. 10 in addition to the basic price of the goods. He would be required to deposit the CGST component into a Central Government account while the SGST portion into the account of the concerned State Government. Of course, he need not actually pay Rs. 20 (Rs. 10 + Rs. 10 ) in cash as he would be entitled to set-off this liability against the CGST or SGST paid on his purchases (say, inputs). But for paying CGST he would be allowed to use only the credit of CGST paid on his purchases while for SGST he can utilize the credit of SGST alone. Refer the diagram below for better understanding. 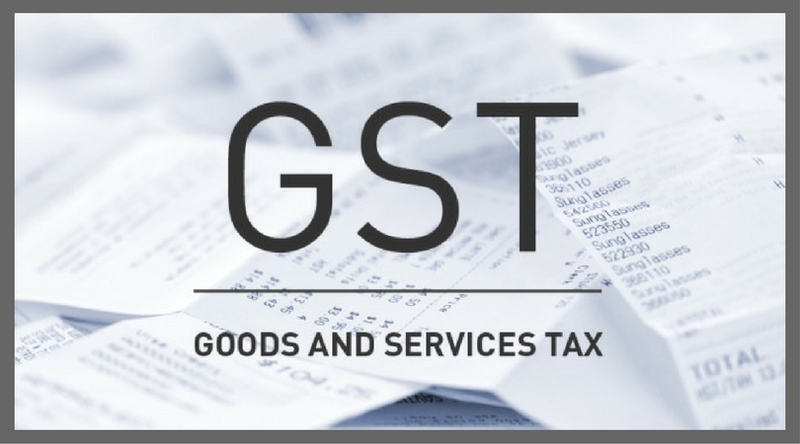 Under the GST regime, taxable event is supply of goods and/or services. To understand what constitutes supply, refer the pdf file attached at the end of the post. The liability to pay GST is on a taxable person under the Model GST Law. Aggregate turnover shall include the aggregate value of all taxable and non-taxable supplies, exempt supplies and exports of goods and/or services and exclude taxes viz.GST. Aggregate turnover shall be computed on all India basis. Small taxpayers with an aggregate turnover in a financial year up to Rs. 50 lakhs shall be eligible for composition We will cover composition scheme in our coming articles. Transaction value refers to the price actually paid or payable for the supply of goods and or services where the supplier and the recipient are not related and price is the sole consideration for the supply. It includes any amount which the supplier is liable to pay but which has been incurred by the recipient of the supply. Reference to Valuation Rules is required only where consideration payable is not money, or parties to the transaction are related or transaction value declared is not reliable. GST will have a far-reaching impact on almost all the aspects of the business operations. For instance, if we talk about sourcing of products, with GST regime, inter-state procurement could prove viable as now input tax paid can be claimed as credit and now rate neutral compared to intra state sales. Further, sourcing economics with respect to imports will see a shift as now additional duty/CVD and Special Additional duty (SAD) components of customs duty which are non-creditable to be replaced by GST. Similarly, change in tax system will warrant changes in procurement and distribution arrangements. The business entities might now feel the need to consolidate logistic partners as well as might feel the need to set up mother warehouses and regional hubs only. The pricing of products will need a thorough review specially price-sensitive products in view of fact that there will be a significant redistribution of taxes across all categories resulting in reduction in taxes on manufactured goods and hence impacting the pricing of the product. A substantial change would be required to accounting and IT systems in areas of master data, supply chain transactions and system design. Existing open transactions and balances as on the cut-off date need to be migrated out to ensure smooth transition to GST. The above article has been prepared based on “FAQs on GST” by NACEN available in public domain. We have attached a copy of compiled FAQs here to be serve as quick handout. We will be covering GST topics on registration, payment of taxes and returns in our next articles. Stay tuned. Post in your queries if any.